Appraisals are the tool that companies use to assess the performance of each employee and through the use of a Competency Model they can also measure the way in which employees approach their performance in addition to the outcomes they actually achieve. This detailed measurement will also allow for talent development and the assessment of future targeted recruitment requirements. 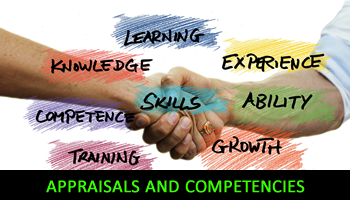 To discuss any issues around how appraisals and competences can be used to improve the performance of your business please give me a call on 07850 208701 or email me on rcwhrsolutions@talktalk.net noting your contact telephone number and I will come back to you as soon as I possibly can.